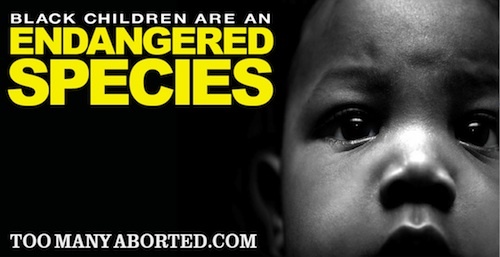 In 2011, religious conservatives funded an antiabortion campaign that included billboards that cropped up across the country, targeting black women and communities with anti-choice messages like: “The most dangerous place for an African American child is in the womb,” and “Black children are an endangered species.” The billboards perpetuated dangerous stereotypes about black women and aimed to shame black women from having agency over their bodies and reproductive health. Reproductive justice organizers rallied across the country to get the racist billboards taken down. When the billboards came to Oakland, California, in summer 2011, Strong Families, a multiracial organizing project of Asian Communities for Reproductive Justice (now Forward Together), contacted the Center for Media Justice to provide comprehensive communications services to help mount a strategic response. As a grassroots campaign with limited funds and staff, Strong Families knew strategic communications would be essential in a campaign to dismantle the billboards. Though it was apparent that a local anti-choice pastor was partnered with the billboards’ rightwing funders, it was difficult to identify a media target. The billboards initially garnered some attention from local newscasters, but media coverage was vague and largely riding the coattails of the billboard story from other cities. In addition, Strong Families recognized that the news reporting promoted messages and assumptions that the black community is anti-choice. It was clear to Strong Families that their campaign would require creative tactics that went beyond a defensive front in a newsprint war. Strong Families and the Center for Media Justice quickly assessed that the greatest opportunities lay in creative action that simultaneously advanced racial justice and reproductive justice movement goals. Strong Families’ response had to be smart in how they challenged the racist framing of this anti-choice campaign. It was decided that the most effective intervention Strong Families could devise would elevate the voices of black women and their communities in the public debate—and a powerful video campaign would achieve just that. Within a day, Strong Families and the Center for Media Justice hit the streets to conduct video interviews with black women, men, and teens in front of the billboards, asking for their opinions on the billboards and on reproductive choice in general. Across the board, interviewees were offended by the messages promoted by the billboards. While opinions on abortion differed, each of the dozens of interviewees we spoke with thought women have the right to make decisions about their bodies and family planning for themselves. Center for Media Justice edited and placed the videos, and worked with Strong Families to develop an impact strategy. Center for Media Justice upgraded the Strong Families’ website to include an online pressroom, tailored and targeted Strong Families’ press lists, and developed a video marketing strategy integrating new media tactics that would lead to industry media coverage. The videos were an instant hit online with organizational allies, blogs, and key journalists, and at the time this was written, the Strong Families YouTube channel had almost 24,000 hits, the bulk of which occurred immediately after the billboard interviews were launched. The videos helped Strong Families build its online list of supporters and introduced the campaign brand, using strategic communications to take quick and effective action. The videos elevated the voices of black Oaklanders talking about the right to choose; the right to healthcare access; and the right to decide when, where, and how to plan a family. Strong Families ensured that the black community itself had a voice in this important conversation—a voice that was being misrepresented by industry media. The Center for Media Justice helped Strong Families create a timely product that filled a strategic void and served as an organizing flashpoint to bring those most affected to the table. Accompanied by a clear distribution strategy that utilized trusted networks and experts, the Center for Media Justice helped ensure that Strong Families maximized its impact.